So here we are with the down-tempo section of the class today – ladies and gents, here are the peptides! Despite sounding like a 50’s digestive aid, “the peptides” were a welcome surprise in my inbox. I have also discovered that the peptides are actually the pseudo art project of singer/songwriter Claude Marquis, with assistance from inspired vocalist Pam Kapoor. I have to say that I tend to lean to the lo-fi and mellow in the first place, so this suggestion was like they say “fish in a barrel”. While I do enjoy a down-tempo track, it still has to be enjoyable, I mean good harmony, vocals and overall quality listening times must be present, no problems here. Also, myself being Canadian, I am always looking to represent some “local” talent. I just had a conversation on the weekend, that I complain about other locations having soo many talented bands – I had to be reminded that there are numerous quality bands from Canada. I quickly shut my yap (or stopped typing) and low and behold, more Canadian talent in the peptides was awaiting me. 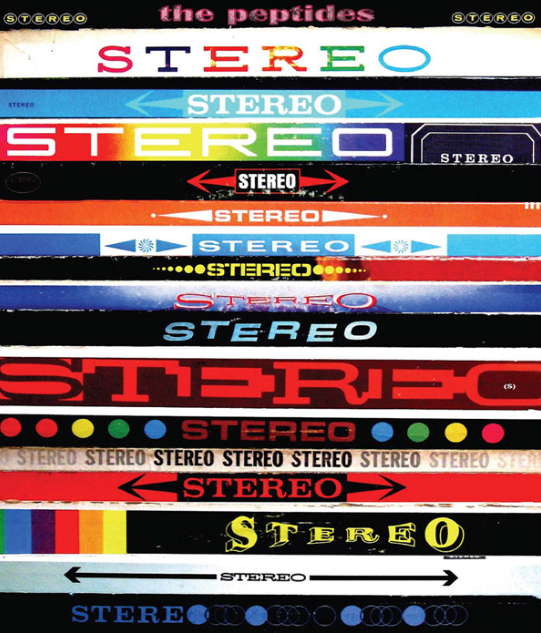 The newest album (and their second to date) “Stereo Stereo” is a collection of woozy original tracks paired with covers of yesteryear. There is a bit of niche marketing here with what I can make out – retro folk almost. Not classic Dylan folk, but retro in the way you liked taking acid and enjoying “free love” and wearing platform shoes. I can’t put my finger on it, as my finger is too busy tapping to the music…if I had to say. Visit the peptides on MySpace and their Website. Make sure you swing through their “demos” and “daily offerings” for many more complimentary offers. Pick up a copy of “Stereo Stereo” over on CD Baby here.